When I feel low and funky, nothing snaps me out of it more than a good ghost story. It’s the most primal and ancient of all horror genres and I spent many a happy afternoon cruising around looking for abandoned houses to check out in hopes of finding a spook. There are more literary ghost stories than I could even hope to read, but as far as movies go, there are three towering works that define the haunted house genre. The earliest is the 1940s gem The Uninvited starring Ray Milland and Ruth Hussey as the couple who buy a beautiful seaside mansion only to discover it’s haunted. The film starts out as a light romantic comedy but becomes gradually darker as the secrets of the haunting are revealed. This movie created the general set up for every intelligent ghost chiller to follow. Many regard 1963’s The Haunting by Robert Wise as the definitive film in the haunted house milieu. It is a much darker and frightening work than The Uninvited, featuring an evil house that seems to add ghosts to its collection on a regular basis. The chills were subtle but strong in this one. My personal favorite is The Legend of Hell House from 1973. Inspired by Richard Matheson’s terrifying novel, this one scared the living hell out of the young Doctor when I first saw it. It takes the familiar scenario of paranormal investigators inspecting a shunned mansion for ghosts, but kicks things up to a frenzied level, with a truly malevolent spirit masterminding lethal attacks on the investigators. It’s been a long time since I’ve seen a really good haunted house flick in the classic tradition. Most modern versions are crippled by clichés such as CGI ghosts, cheesy jump cuts and unlikeable characters. This brings us to the subject of this particular missive, the new film Ghosts of Darkness. 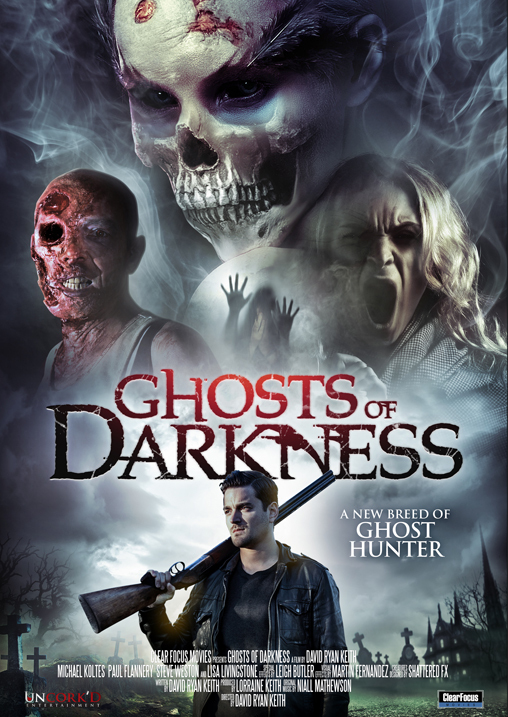 It’s pretty clear that the writer and director of Ghosts of Darkness, David Ryan Keith, is a fan of all three films mentioned above and wanted to make his own contribution to the haunted house genre. While I wouldn’t quite put this film at the same level of those classics, it does emerge as an enjoyable foray into haunted house movies. There’s some modern gore and edginess to this film, but it really reminds me of a more explicit version of those great made-for-TV chillers of the ‘70s and early ‘80s. The set up here is even more basic and stripped down than the older films. A couple of ghost hunters with wildly different approaches to the business are confined to a cursed mansion to see if they can last three consecutive days in the structure. Let’s look a little closer at Ghosts of Darkness…. We open with a very nice and scenic look at the location of the movie, a beautiful old mansion in the remote Scottish countryside. It doesn’t look like it would be the source of bloody mayhem, but we find out how wrong that idea is very quickly. Pity the poor Johnson family, the latest residents. Before five minutes elapse, they have all died extremely bloody deaths, apparently at the hands of teenage daughter Sarah, who is possessed by something lurking in her closet. This is merely the latest in a long string of horrible events at the deceptively bucolic residence. 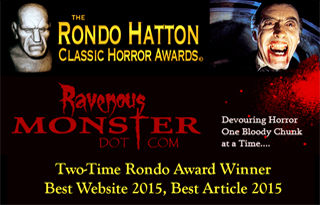 There is a history of violent death, insanity and more stretching back 200 years at the mansion. Following the slaughter of the Johnsons, it stands uninhabited…until the arrival of our protagonists. These two men are both well acquainted with the supernatural, but from radically different perspectives. Jack Donovan is an aloof and rather self-centered skeptic who takes special delight in uncovering fraudulent spiritualists. He is an almost ferocious rationalist. His diametric opposite is Jonathan Blazer, a rakish and dissolute English psychic who claims to talk to the dead on a regular basis. Each man is considered the best in his own field, but they couldn’t be more different. Upon arrival in the abandoned mansion, they meet the mysterious man who invited them. He has a simple proposal for Jack and Jonathan: They are to spend three consecutive nights in the mansion. They will not be allowed to leave the premises during that time. If they complete the assignment, they will each be given $50,000. The cash is enough to convince the very disapproving Jack to stay. Jonathan is quite broke due to his gambling habit and all too happy to comply. The mystery man admits that he himself doesn’t believe the house is haunted at all. But its long history of awful events has rendered it impossible to sell on the real estate market. Having the two ghost hunters “clear” the house will get rid of the stigma and allow it to be sold at a handsome price. Or at least, that is what he says. The rest of the movie finds the two protagonists alone in the cursed mansion. They are immediately at each other’s throats, with Jack considering Jonathan little more than a small time crook. But they also find out that each has secrets he is concealing from the other. And of course, there’s the small matter of the ghosts. The house is teeming with them. All of the Johnsons are there, along with a bloody bearded brute with the worst case of astigmatism I’ve ever seen and another fellow who seems to be the recipient of a buckshot facelift. A tragic incident from Jack’s past is revealed, uncovering the reason he hates psychics and mediums with such fierceness. Eventually, he’s forced to recognize the reality of the haunting…just as Jonathan theorizes that the house is hiding something worse even than ghosts…a demonic presence that is hell bent on a very specific vendetta. The rest of the film follows the uneasy allies as they pit themselves against the demon lurking in the house…and learn the real reason for their presence there. Ghosts of Darkness stands at the crossroads of the classic ghost film and the more modern, effects-driven version. After opening with the gory murders of the Johnsons, the film is deliberately paced and allows ample time for us to get a feel for Jack Donovan and Jonathan Blazer. As mentioned before, in many ways this is reminiscent of a ‘70s made-for-TV movie, spiked with gore and some profanity. When a film is so narrowly focused on just two characters, a lot depends on the quality of those characters and the actors playing them. Michael Koltes makes Jack a pretty unlikeable character for the most part. He strikes me as kind of a straighter edged and more serious version of Sheldon from The Big Bang Theory…in more ways than one, if you catch my drift. But we find out the trauma that made him so aloof and it’s a pretty harrowing one, so that helps explain why he acts the way he does. On the other hand, Paul Flannery’s portrayal of Jonathan Blazer is a delight from the first moment we meet him. To say he’s a likable rogue is underestimating him. Flannery plays him with wry humor and an undercurrent of sympathy. When he learns the tragedy in Jack’s past, his entire behavior towards him shifts noticeably. He is also quite the demonologist and despite his faults, which are many, he is rather fearless when confronting the ghosts. I think the mansion could have done with being a bit more gloomy and “haunted” feeling, myself. But perhaps its relative “normalcy” is part of the atmosphere director Keith is shooting for. As for the ghosts, they are relatively “modern” in the way they’re presented, with some digital trickery involved. But there’s also practical makeup and effects which are well done, so it’s certainly not as nauseatingly CGI-oriented as it could have been. The only time the ball is really dropped is when we see the demon in charge of the haunting….it looks like it came right out of a video game. It would have been better not to show the fiend at all. As for the resolution of the story, it is bitterly ironic when you consider it and pretty dark. The ABSOLUTE last scene I thought was hokey and tacked on, but it doesn’t spoil the film. 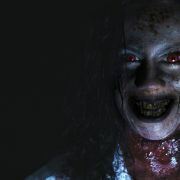 While I would hesitate to call Ghosts of Darkness a classic, it does emerge as an entertaining modern tribute to the evil haunted house genre. Worth a look if you like a little old school mixed with contemporary grue. I just wonder if they’ve been able to sell that place yet….